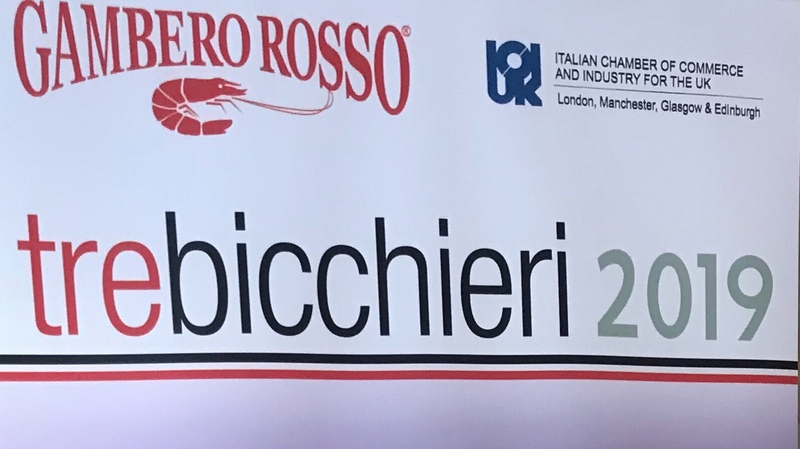 A highlight of last week was the Tre Bicchieri tasting at the Royal Horticultural Halls. With 45 Italian producers showing their wines, I knew I’d get to try some beauties (Italian wine and I are very much in love). My first sip of the day was the Mattia Vezzola Brut Rosé from Costaripa in Lombardy. It’s always nice to start a tasting with bubbles and this was delightful. Very, very pale (much more of a blush), I found it to be wonderfully sophisticated with crisp, lively bubbles. I also tried the Valtènesi Chiaretto Molmenti 2015, which was interesting, because although it was light and youthful, it had seen some oak, making it more textural and complex. Really beautiful rosé wines – and they are made on the shores of Lake Garda, one of my favourite places in the world! I went down to the south next to try the Palmetto Costanzo range from Sicily. Wow, the Etna Bianco di Sei 2017 filled my nose with powerful aromatics of lemons and nectarines – Sicilian sunshine in a glass. On the palate it was fresh with a long mineral finish. The red, Etna Rosso Nero Di Sei, was light-bodied and bone-dry – you could almost taste the altitude! All the works are done by hand at this winery and the quality shines through – not an overripe or underripe grape made it into these bottles. I stayed in Sicily to try a couple of wines from Feudi del Pisciotto. The Cerasuolo di Vittoria Giambattista Valli Paris 2016 was bellissima – it showed like a Burgundy Pinot Noir in its elegance and restraint. The polar opposite to the big American style wines, it was clean, fresh and refined. But Feudi Del Pisciotto can do big wines and we saw it with the Baffonero. 100% Merlot, it was powerful, chocolatey and delicious. Only 3000 bottles have been made of this wine and there was something very special about it. North to the Veneto to taste what Tommasi Viticoltori had to offer. We started with the Aglianico del Vulture Don Anselmo 2015 – Paternoster. Light in colour but full in body (something Italian wines do so well), the thick skins of the Aglianico grape provided ample tannin and it appeared interestingly savoury on the palate – one would go as far as to say ‘meaty’! My friend and tasting partner, Lee, suggested that it’s a great alternative to Bordeaux. We then tried the (drumroll please) Amarone della Valpolicella Cl. De Buris Riserva 2008 and OMG. I love me an Amarone (very little can beat the velvety, chocolatey, spicy, caramelly, absolute GORGEOUSNESS of Amarone) and this one didn’t disappoint – it was all of the aforementioned, but surprisingly youthful and fresh, even after 11 years in bottle, They have made a luxury Amarone for the millennial market – something a little lighter with a robust acidity that can be drank throughout the entire meal, from beginning to end, and even without food at all. It also comes in a plush presentation box and looks the bees knees. Next up were three lovely wines from Tenuta di Angoris in Friuli Venezia Giulia: Collio Bianco Giulio Locatelli Riserva 2016; FCO Friulano 2017 and Refosco P. R. 2016. The Collio Bianco Giulio Locatelli was Lee’s white of the day (reminiscent of a summer meadow – grass, sun, flowers – with some tropical notes coming through with the 10% Malvasia). I liked the Fruilano – even more floral (jasmine, honeysuckle, orange blossom). The Refosco caught a lot of attention, full of contradictions: it’s red but should be served slightly chilled; it’s smoky but it’s had no oak; it’s young but complex. With its high freshness, high acidity and slight saltiness, it would be a great red option for oily fish – perhaps, as Lee suggested, sea bass wrapped in pancetta, served with asparagus. I’m sold. Finally, we travelled to Tuscany to try the wines from Fattoria del Cerro. The Nobile di Montepulciano 2015 was the greenest I’d tried – dry, herbaceous and structured. But my eyes kept straying to their other bottle on show, La Poderina – a 2013 Brunello di Montalcino. Brunell-oh-oh-OH MY GOSH, my favourite wine ever, since being upsold a bottle in Keen’s steakhouse in New York in 2015 and never forgetting the taste. All Brunellos are not born equal and I have tasted a couple that have fallen short of the mark, that don’t quite achieve the balance of POW and restraint, of oak and fruit, of drinkability and complexity – and finally lacking the length that will burn Brunello into your memory forever. This one ticked the boxes: it had the fruits (cherry, raspberry, fig and more); it had the oak, the spice and the tobacco; it had the tannin (smooth) and a nice length. What a great wine to finish on (and excellent with some salami and Parmigiano – my Italian heaven). All in all, Tre Bicchieri was a rather show-stopping showcase. The wines I tried were all memorable, high quality and refined – many were lighter on the palate than I expected them to be, but with all the structure, layers and complexity I was looking for. I think that’s called elegance. I recently read something in Oz Clarke’s book, Red and White, about a time in the early 2000s where many wines started to taste the same – big on fruit, big on spice, big on texture – and were beginning to lose their sense of place and terroir. Tuscan wines were tasting Californian, some French Merlots could have been Chilean – and there wasn’t much difference either way. I feel like these wines were completely of their place (the unapologetically herbaceous and stalky Montepulciano from Fattoria del Cerro springs to mind) and that’s what makes them unique, interesting and desirable – which can only be a good thing. Love this article. Makes me want to go to Italy again!